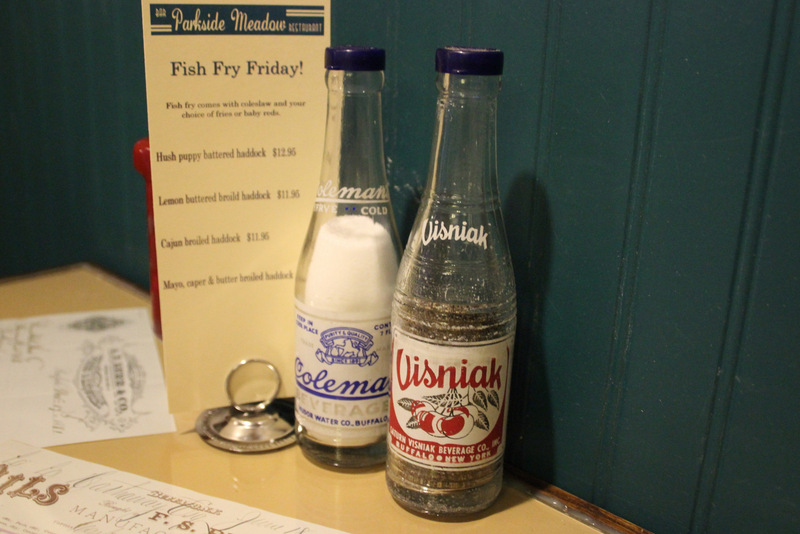 Visniak was the unofficial soft drink of VFW Posts, corner gin mills, and East Side homes where the Visniak van would make weekly drop-offs of cases filled with a rainbow of pop flavors. Hattie Pijanowski, along with her husband, Edward, started the Visniak-Saturn Beverage Corp. on Detroit Street on Buffalo’s East Side in 1931. In 1939, the plant moved to Reiman Street in Sloan. 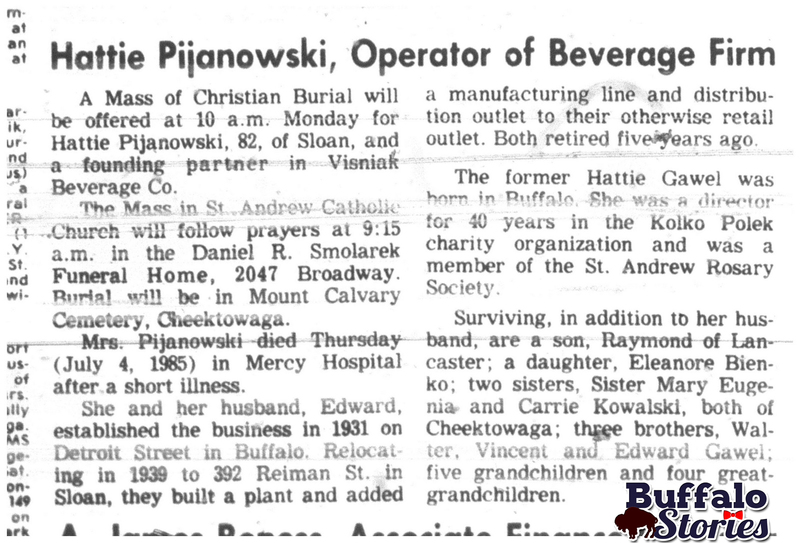 Edward Pijanowski became active in Sloan politics and ran for mayor of the village in 1951. 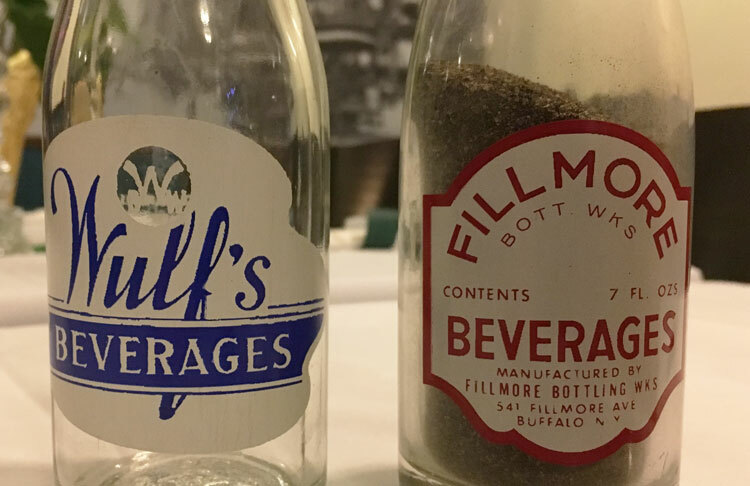 The company, which employed ten in 1968, brought colorful and tasty pop to generations of Buffalonians two different ways– in 7.5-ounce glass bottles and from barroom “pop guns” all over the city. 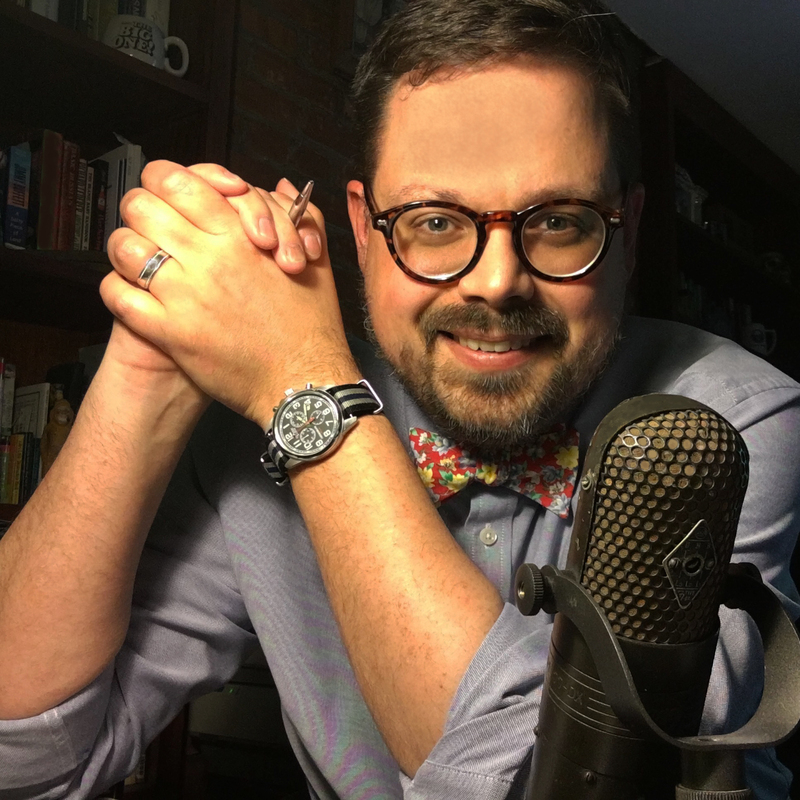 Chances are pretty good– if you ever ordered a Coke in an East Side tavern sometime between the ’50s and the ’90s, you were likely drinking a “VEESH-nyak” (from the Polish for “cherry”) and didn’t even realize it. Hattie Pijanowski died in July, 1985, at age 82. Her son, Ray, was 70 when he closed up the business in 2004, “because nobody returned the bottles,” and a new bottle cost more than what that bottle filled with pop would sell for. 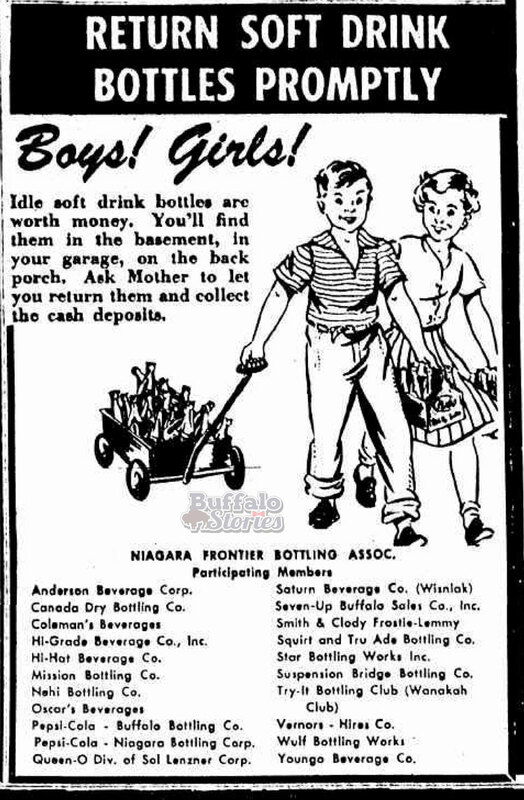 In 1959, the Niagara Frontier Bottling Association took out an ad to remind Western New York’s children to bug their parents about returning soft drink bottles promptly. 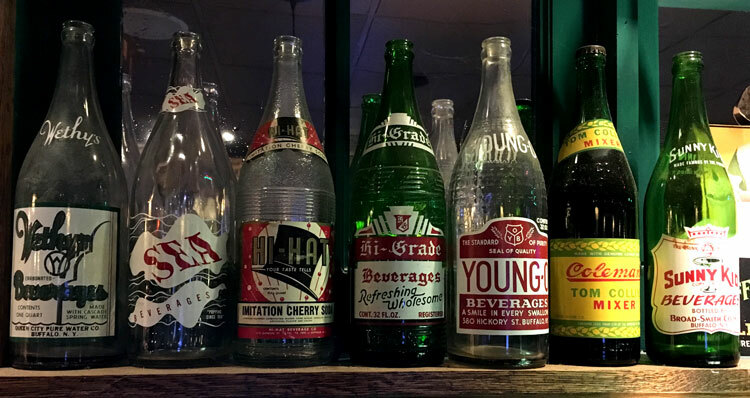 The Niagara Frontier Bottling Association had 21 members, including the giant names of Coca-Cola, Pepsi and 7-Up, but also much smaller local operations like Visniak, Queen-O and Oscar’s. Just as breweries offered home delivery for committed patrons, many pop bottlers would also drop off soda by the case at your doorstep. “Ask mother to let you return them and collect the cash deposits,” says the caption next to the happy boy and girl pulling a wagon filled with pop-bottle gold. 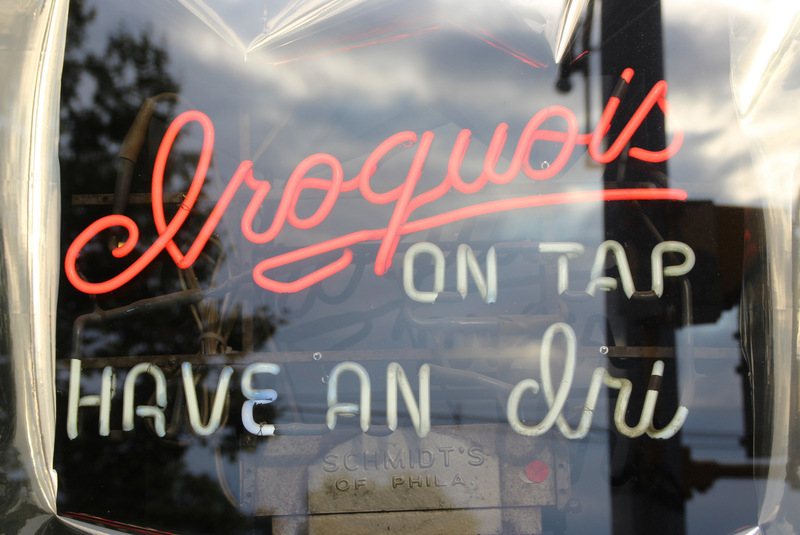 Luckily for us nearly 60 years later, not everyone heeded that “bring the bottle back” advice – and many of the classic bottles from long-gone pop makers are still kicking around. 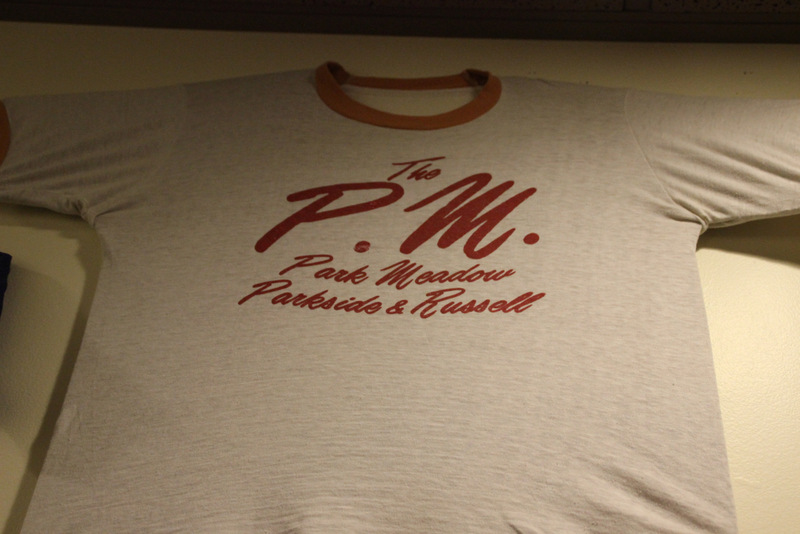 Len Mattie and his wife, Nancy Abramo, run the Parkside Meadow Restaurant. 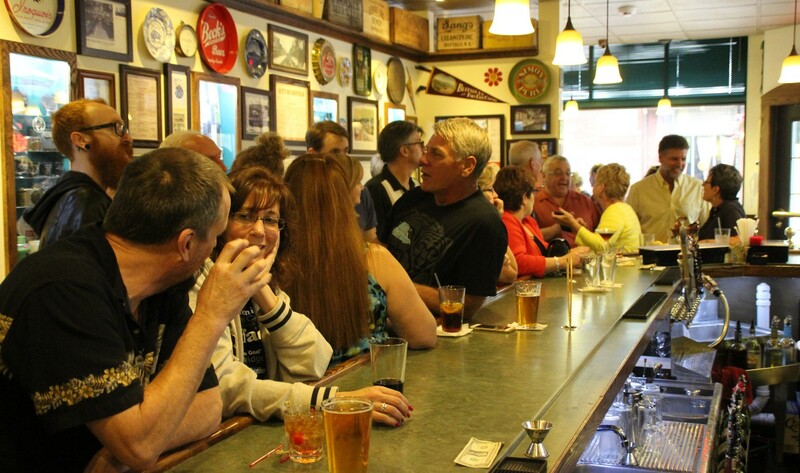 Throughout the classic neighborhood corner tavern, Mattie has displayed what is possibly Western New York’s largest public collection of local pop bottles – among them most of the brand names mentioned in the ad. 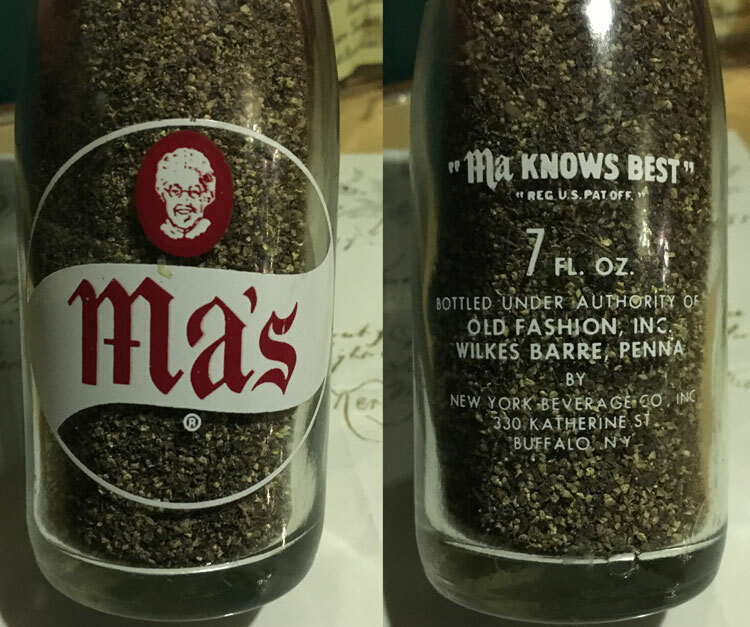 Ma’s was one of several pops bottled by the New York Beverage Company on Katherine Street in the First Ward. Kist was bottled by Goddard/Kist in Buffalo. 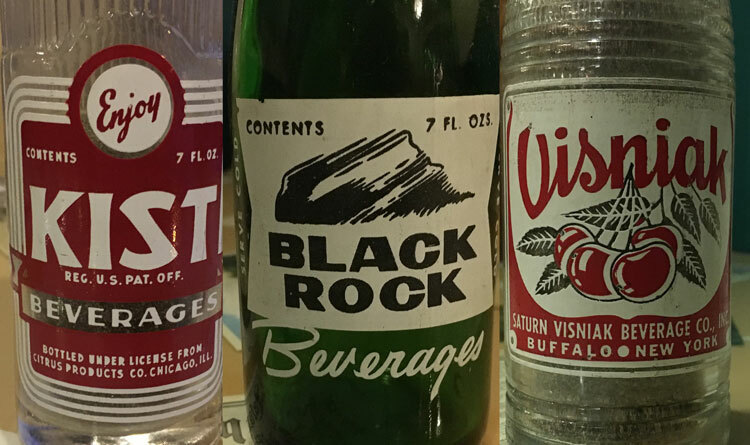 Black Rock Pop was bottled by Black Rock Beverages on Hertel Avenue. 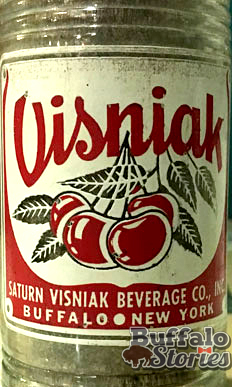 Visniak was bottled by Saturn-Visniak Bottling on Fillmore Avenue. From left: Wethy’s was bottled by Queen City Pure Water; Sea Beverages is from Buffalo; Hi-Hat Beverage was at 416 Chicago St.; Hi Grade Beverage was on Fougron Street on the East Side; Young-O Beverages was based in a garage on Hickory Street; Coleman’s Beverage was on Rhode Island Street on the West Side; Sunny Kid Beverages were bottled by Broad-Smith, 528 Genesee St.
From left: Mission Beverages was located at 127 Kehr St.; Dr. Swett’s was based in Boston, Mass. 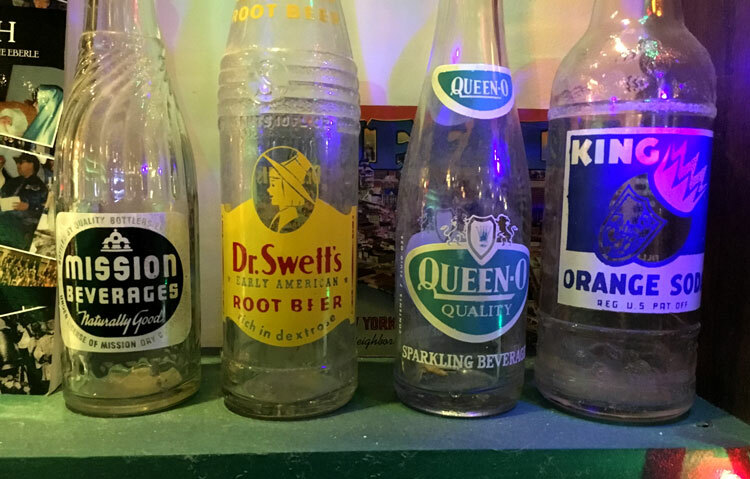 ; Sol Lenzner’s Queen-O was produced at 636 Genesee St.; King Orange Soda was bottled locally by Fillmore Bottling Company. 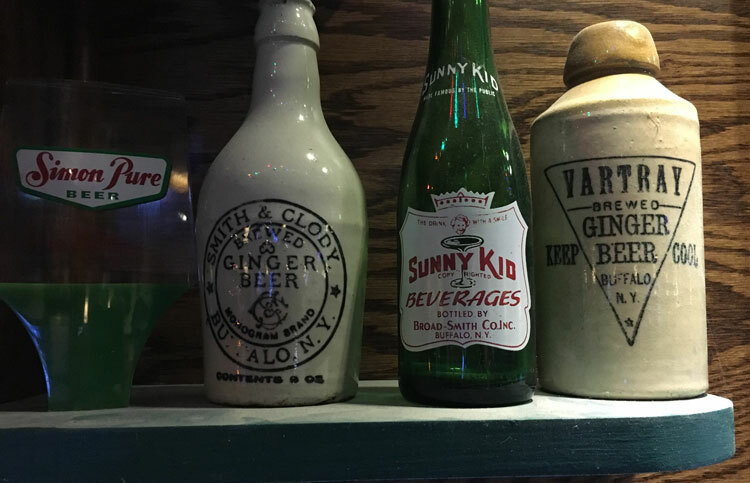 The Smith & Clody and Vartray ginger beer stoneware bottles date from the turn of the century. 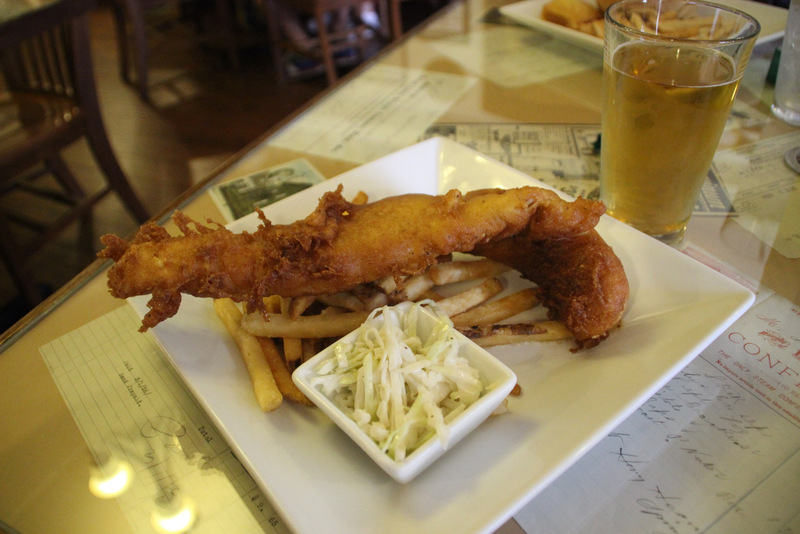 Wulf’s Beverages was based in North Tonawanda. The Fillmore Bottling Works was at 581 Fillmore Ave.